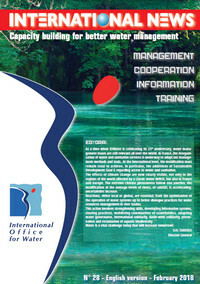 The International Office for Water proposes to discover all of its activities and those of its partners in France, in Europe and in the world through its annual review "The News of IOWater". This publication is available in electronic and paper versions (on request). The journal's archives are available online since 1993 (access the archives from the French page) . The News is available in French, English, Spanish and Russian.